What about a clear enamel coating? Enamel is basically just glass, and if it wears, cracks, or falls off/out, it can be replaced with a new enamel coating. 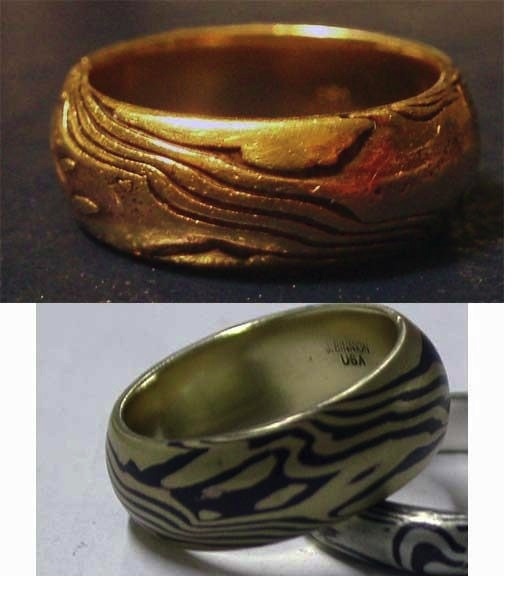 For example, if you “pre-etch” a ring to the extent of day 7 in your test, the copper is recessed at a depth below the silver, so you could enamel that recessed depth or use some other durable sealant to protect it.If it’s enamel, it might not even require maintenance, unless the ring is dropped hard, which would damage any ring. 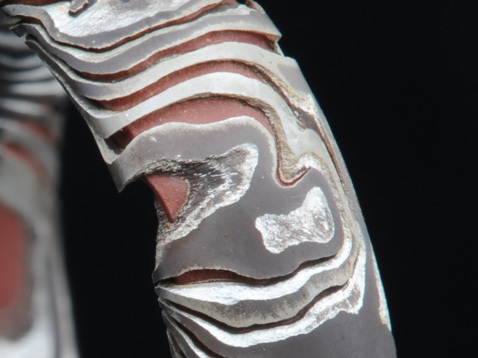 It might not be done due to the expense, but if a mokume gane artisan like yourself were contracted to produce planchets, it could be a helpful line of business because coin collectors are much like jewelry buyers in their desire for uniqueness, rarity, and beauty – they’re both willing to pay well for the things they like. Enamel will not work in this case first due to the melting point of the enamel. 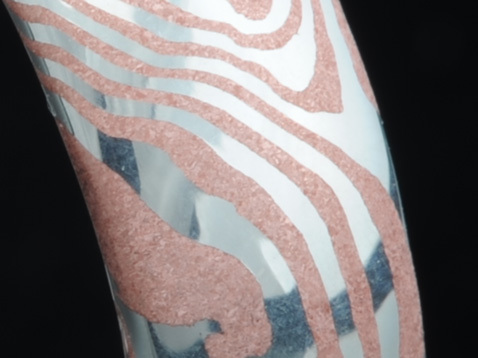 Copper/Silver mokume will begin to melt at 1435°F, enamel needs to fire between 1400°-1500°F with better results at the higher end of the range. The second problem is enamel will not survive intact on a ring for any length of time. That said the problem is only really an issue for rings as they are exposed to water on a regular basis which is required for the galvanic reaction. Other jewelry or eve coins would be less affected as long as kept dry. There are many copper alloys that are corrosion resistant, even in a highly galvanic saltwater environment. I’m thinking about phosphor bronze used for propellers in oceanic vessels, directly in salt water. Also beryllium copper, aluminum nickel bronze, and probably many others are very corrosion resistant. The beryllium copper is just an example, but the safety risks, if any, would have to be studied before you decided to use it. I have experience with it, and I think it’s at least worth mentioning as a possibility. I haven’t studied the galvanic potential of metal combinations without silver, but it might be possible to use something else that won’t support a galvanic reaction. Phosphor bronze is routinely used in ships along with steel in saltwater, so maybe a steel alloy would work instead of silver. There’s also things like the copper nickel alloy used as the cladding over an exposed copper center in USA coinage (I assume you’re in the USA), which obviously bonds well, doesn’t corrode, and remains bright and shiny much longer than authentic silver. 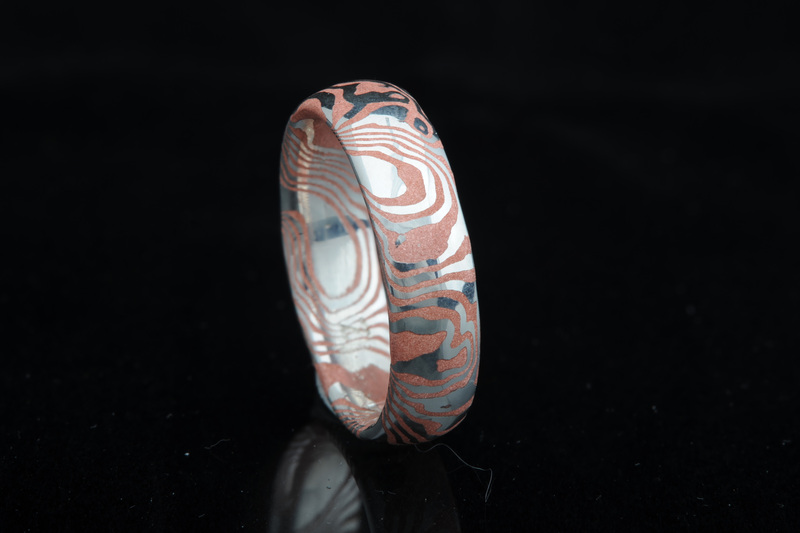 If I wanted to fast-track an experiment in a mokume gane ring, I would get some large copper-nickel clad coins like Eisenhower dollars or Kennedy half dollars that already have bonded layers, and go from there. If you wanted to do the bonding yourself in a sloppy experiment, you could stack up some USA nickels, which are solid copper-nickel alloy, and put pre-1982 copper cents in between them. Or, use dimes and cents for a closer diameter match. You might have enough metal in your pocket do a rough experiment like that right now. 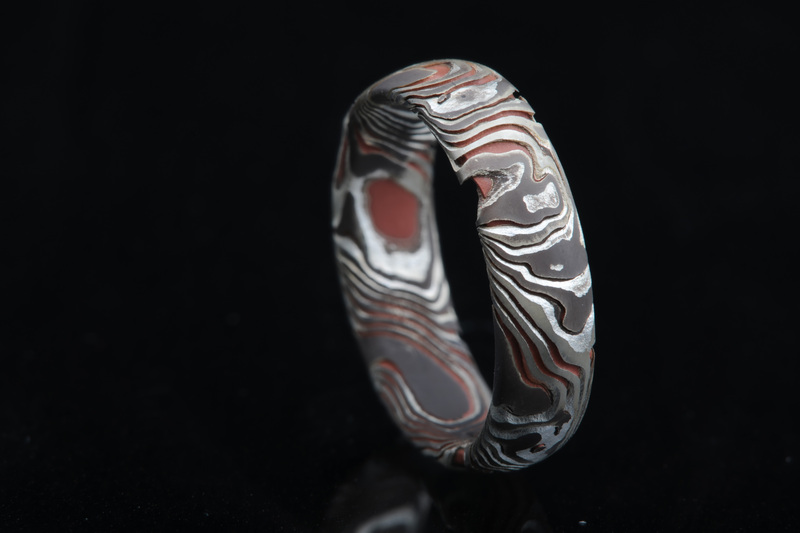 The process of making mokume is extremely fascinating to me. I have a question. 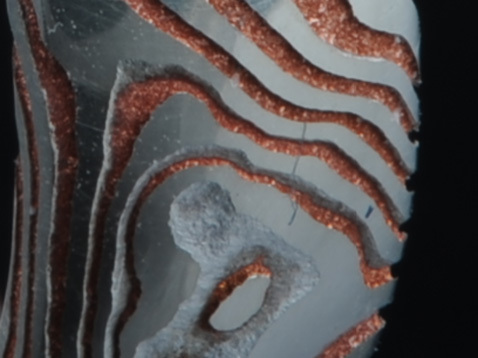 What if you used nickel-silver with copper or say brass, would there be erosion with these combinations? Yes but not quite as fast. Thank you! I really appreciate your time spent sharing this intel. 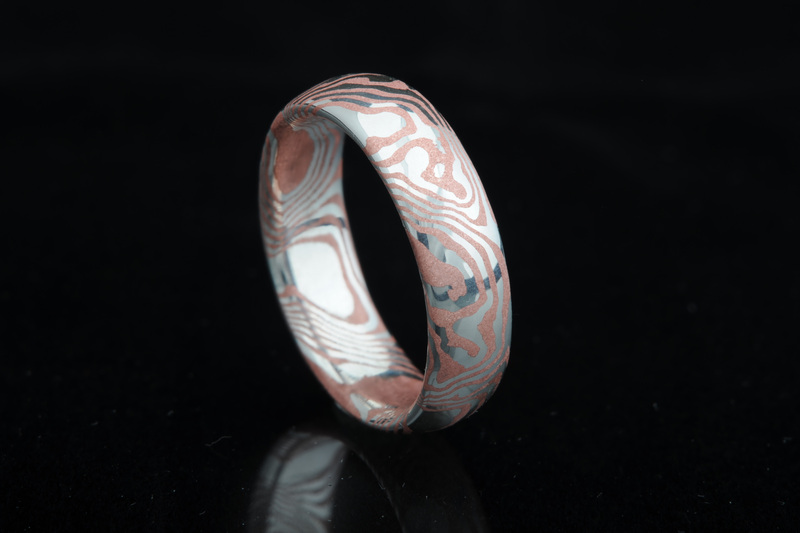 I made a copper/Argentium Mokume Gane ring for my husband about a year ago. I took pictures of it the other day when I went to make it a half size smaller for him. It shows the corrosion from your 1-3 day test pictures. He doesn’t wear it at night or hanging out at home. When this one falls apart I’ll do one for him in gold/Argentium. Would there be a way to make a copper alloy or something that would look like copper but wouldn’t break down? What about doing it with copper and brass? Also the end result is beautifu. 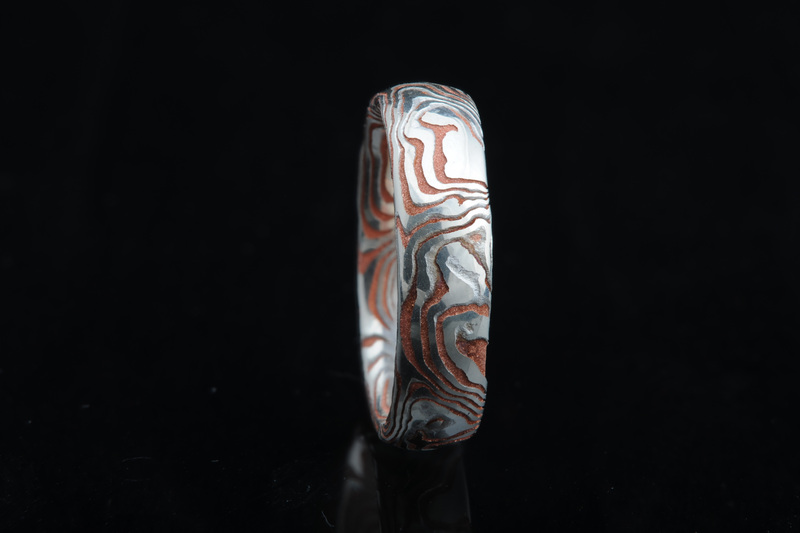 Couldn’t you electroplate the super degraded (freaking beautiful) ring in silver, and retain the integrity? Then just patina it back to the look using liver of sulfur. from now on…it’s for earrings only in my shop. Thanks for taking the time to share this after all your researching! A very interesting article to stumble across in my search of some different wedding bands. 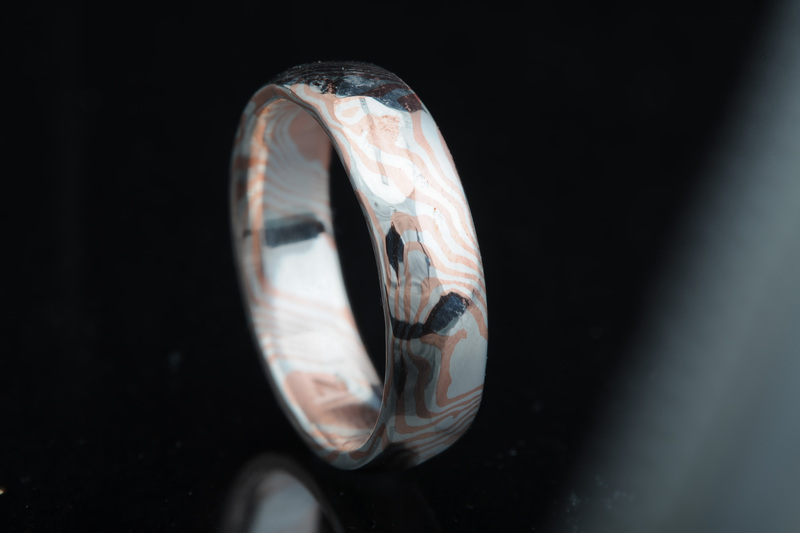 I’ve been looking at mokume gane rings (some of yours in fact) and would like some rose gold in it to add a more rustic look.. For both price and to maintain the white appearance, I would prefer to use palladium in place of a white gold. Would this be stable? I see that even palladium can sometimes have a copper alloy. Should I try to avoid this as the alloy? What about simply not using a noble metal at all? If we only used base metals, and no noble metals, would this still occur? Would the process be slowed at all?